We support President Obama's proposal to provide health care for the roughly 30 million uninsured and removing obstacles for people with preexisting conditions to get insurance. 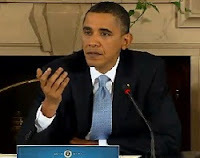 With that said, I noticed the two Pothos plants behind the president during the marathon health care summit at the Blair House across the street from the White House. I love the Pothos. Botanically it is Epipremnum and their trailing nature makes them extremely decorative. I have two of them crawling all over my office and around my computer screens. 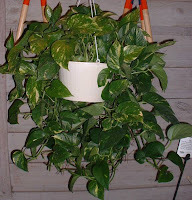 The wonderful Pothos prefers low light and moderately most soil. This gloriously uplifting plant also likes a moderate to warm temperature of 62-80 degrees F. Some of my Pothos plant arms stretch out to 15 feet or so. It is such a soothing plant. Maybe that is why the plants were strategically placed behind the president as he jousted with Republicans over American health care. One Pothos arm can be seen creeping down right behind his left should in the photo above.